Rated 5 out of 5 by BigJoe from Awesome unit, lots of power All the power that I needed to power wash a 100 year old barn clean enough to have a family reunion. Did an excellent job and was very quick to get done. Would recommend this unit to anyone with a big cleaning project. Rated 4 out of 5 by deraeler from love it so far This is a heavy duty tool fit for all tasks I can think of. Any final review is contingent upon how it weathers through winter storage, if the pump seals last and the winterizing fluid I purchased from Generac for it works well, then we should be all good. I am worried about storing it in sub-zero temperatures. I love the convenient storage location of the various nozzles, and the wand is nicely designed. Minor complaints: the suction tube for detergents floats, need a way to have this stay submerged in the bottom of a bucket/bottle. Clamps etc. I've tried just restrict the detergent flow. Maybe a weight of some sort. Also this needs to be kept off the hot engine, I used twist ties strategically placed along the hose. Second, the main hose is unwieldy, but it's tough to come up with a solution to this - the hose holds a lot of pressure and needs to be sturdy, but that makes it tough to coil/manage. But moreover, this also needs to be kept away from the hot engine. I tried looming it up with what appears to be a plastic hangar (perhaps intended for this purpose?) near the wand storage area, but this wore and ultimately broke due to the high stress the hose puts on it. Some sort of a sturdy loom is needed to keep the hose from getting destroyed by contact with the hot engine. This is admittedly not a huge risk, as the frame around the engine does a decent job of preventing incidental contact, but it can happen, and when you're busy working you can't easily babysit the hose. Lastly, for anyone washing large patio/deck areas, the rotary attachment is an absolute godsend. This thing works, and is a great value. It literally reduces job time by 400% or more. Keep in mind this is a serious tool - my wife is too small to handle this thing - it pushes enough force to jerk the wand and push her. It does what it's designed to do, but the hobbits in your life may wish to stick with a garden hose. Rated 5 out of 5 by bigpape from Product is excellent Love the size and power of this equipment. Does a great job with washing my concrete with the turbo tip. Good job Generac!!! 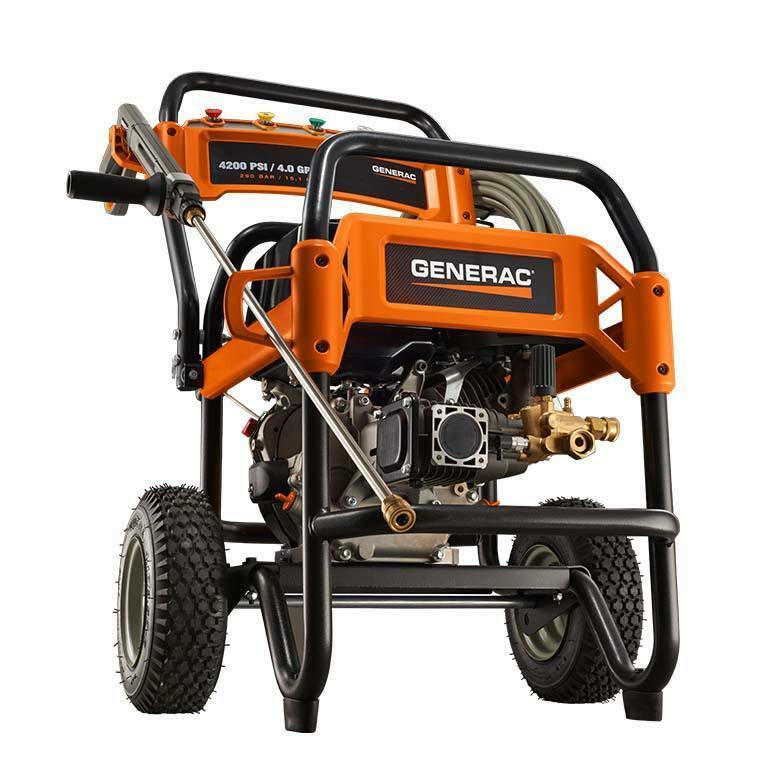 Rated 5 out of 5 by Nick8954 from Great machine Absolutely love this machine, I grew tired dealing with cheaper off brand pressure washers that lacked both performance and quality. After doing extensive research on various models over several months time. What made me choose this model 6565 4200 psi 4.0 gallon per minutes machine was due to the level of power combined with the high rate of flow, along with the warranty. I’ve only had this unit about five months but I can say the versatility is flawless. It was powerful enough to make my old nasty concrete look brand new, but I can also switch to a weaker tip and wash my truck and my UTV’s with no issue. Bottom line I am very impressed with the performance and quality of the machine. Rated 5 out of 5 by Ruben from Excellent Looks great and easy to use. Started on first pull! Great packaging. Rated 5 out of 5 by Brad23 from Powerful, quality machine I haven't had my pressure washer long but I used on my house siding, and washed vehicles with it and it works great!! I'm very happy with my purchase! Rated 5 out of 5 by Chris23 from Awesome Product thus far Awesome pressure washer. I use it commercially and residentially as I have a business. I would definitely buy another one if I ever need to. great product and would recommend it to anyone! 4200PSI Commercial 6565 is rated 4.5 out of 5 by 21.